In 2007 when the founder members met to gather and cement their ideas for a new UK Diary, we had a clear vision but little money between us to fund this project. We wanted it to be a celebration of the work of UK artists and writers who shared our deep love for this Land and the wish for a sustainable future for all. It was to be more than just a diary, more a networking resource, which would inspire people who actively create positive change in their lives for the benefit of this good Earth. While we had friends who as artists and writers would be happy to contribute work for the first edition, we needed a way to gather the funds necessary to print the diary. This was in truth a considerable sum and so the idea formed of creating “Moon Shares” as originally we were to be a Moon Diary. The Moon Shares were to be a generous loan which we planned to pay back as soon as we could support our own printing cost. A call went out and over the years, the loans from 58 wonderful souls and donations from friends and contributors, allowed us to print the first five diaries. The time finally arrived when we had funds to cover our printing costs for the diary and enough to repay all Moon Shares. It was a long and eventful journey and we still frequently give thanks to all who have travelled with us. The continued sales of diaries to our wonderful community means that not only could we repay our Moon Shares but we can also put our profits towards Seed Funding small projects designed to support the Earth. 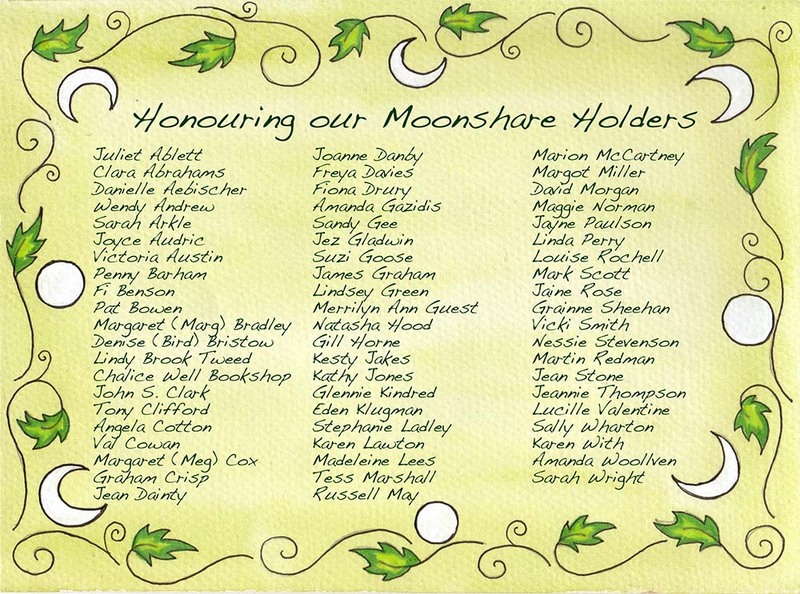 We wish to thank everyone who so generously bought 'Moon Shares'. We would not have got here without your support and faith in us and the diary. Your names will be held on a Role of Honour here at the centre of our work to remind us of your unconditional patronage. We cannot thank you enough. So a very BIG THANK YOU to Our Moon Share Holders for your support!